When I first came up with the project "Back To The Land", I wanted to create a short trailer to help tell the story of the people I have photographed thus far throughout Saskatchewan, Alberta, and British Columbia. So I hired Chantelle Kolesnik from DDG (Deluxe Design Group) to work with me and create the trailer for "Back To The Land". I wanted to give the audience a better visual of the project that showed the process of traveling from town to town while inspiring a desire to explore the unknown and celebrate that connection to Canada for those who call this country home. For the human element of the trailer, we needed to find someone who not only fit the project scope and vision but also someone who was comfortable in front of the lens. That's where Susan Murray (Suzie) came on my radar and who I also wanted to photograph for this project. After a little convincing and once Suzie agreed, the next thing was to decide on a location to tell her story. I started to scout around the Crowsnest Pass and for those that do not know, it is made up of five small towns; Bellevue, Hillcrest, Frank, Blairmore, and Coleman. Having access to such an array of communities, this gave Chantelle and I a huge variety of material to work with. From small towns, open fields, Rocky Mountains, rivers, and more, Chantelle and I spent two weekends out in the Crowsnest Pass filming 14 hours a day and driving as far as Brocket and Fernie to get the shots we needed to bring the whole trailer together. After the trailer was launched and photographs edited, I recently sat down with Suzie to find out more of her life story. Suzie was born in Kingston Ontario then moved briefly to the UK and then back to Canada where she received a BA in Philosophy. From there she spent the next 10 years travelling all over the world as far as India, South East Asia, Australia, New Zealand and Nepal. With her love for travelling she would return back to Canada every so often working in Banff in order to fund the next adventure halfway around the globe. When I asked Suzie about each of these places she visited, she had few words but looking into her eyes I could see the memories flash with expressions of joy and subtle smiles that revealed everything that words could not express. Speaking from experience and when you actively travel and live in another country, it's hard to find the words as most people who travel will tell you it's one of those things that you do, live, and experience. Suzie did however say "I don't think I'll ever return to Europe". With all the traveling Suzie did your probably wondering how and when she made The Crowsnest Pass her home. Suzie did visit the Crowsnest Pass when she was 29 meeting a guy which ended up becoming her husband Al, however her first impression of the area was far from sublime and I quote "Why would anyone live in this god forsaken town". Marrying her husband Al and finding a love for fly fishing, she soon feel in love with the area and fast forward to 1998 when Suzie decided to open up The Crowsnest Cafe' in Blairmore. Then in 2003 she moved the cafe' to Coleman inside a tiny little house neighbouring the 7-Eleven on highway 3. Then again in 2004 took on a small demolition, knocked down some walls and added a fly shop which is now the Crowsnest Cafe' and fly Shop. 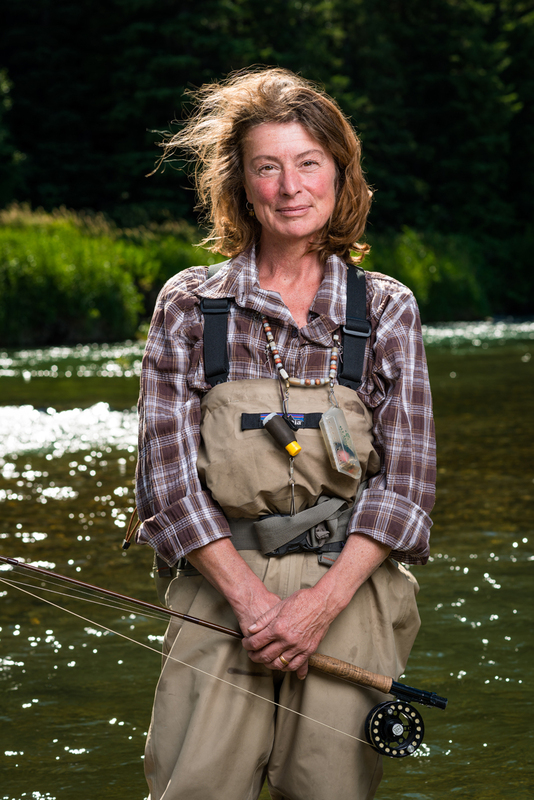 Along with serving up homemade and organic food, she and her husband also guide on the river systems that surround the area sharing the world-class fly-fishing the Crowsnest Pass has to offer. Most of Suzies clients come from Southern Alberta and BC, but regularly guides for people from Montana, Washington, California, Texas, and occasionally visitors as far as Italy and Germany. If your ever in the Crowsnest Pass area and your hungry, you need to try her homemade soups and pie... it's out of this world delicious. Plus if you gassing up at the 7-Eleven next door save yourself from buying that processed packaged sandwich as The Crowsnest Cafe' and Fly Shop will not disappoint as everything is made from scratch. Plus you can always count on a friendly chat and expect no shortage of other fisherman in the store to geek out on some fly fishing.